Is able to drive positive results and steer the business towards success. At Alankit, dynamic individuals aspiring to excel will find opportunities to work across different geographies and business units in a variety of roles. The work diversity at Alankit exposes employees to a range of industries and business functions. Employees will also engage with different people, across locations and products segments. Alankit nurtures Talent, supports employees in building Capabilities, and champions their Achievements. It encourages employees to grow by providing them a challenging work environment and the right training and learning opportunities. 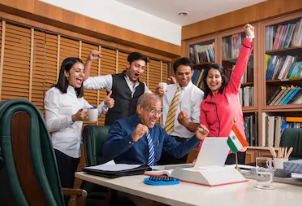 As an equal opportunity workplace, Alankit maintains an ethical, non-discriminatory and meritorious atmosphere, where deserving employees are motivated to advance their career goals. Alankit implements industry wide best practices and adheres to new developments in human resource management. To ensure transparency at the workplace for employees, Alankit has institutionalized its processes across all functions and hierarchies. With employees being the company’s primary asset, Alankit provides employee benefits in line with industry standards. Through intensive engagement and training initiatives, it also enables employees with technical and functional capabilities, while keeping them abreast with the latest technology and industry trends. Alankit’s dynamic and fast paced work environment is present across 12 Group Companies and 3 divisions-Government to Citizen Services, Financial Services and Life Care Services. The company operates through a wide network of 22 Regional Offices across India and 3 overseas offices at London, Dubai and Singapore. Candidates who would like to explore career opportunities with Alankit may go through job postings listed on the company portal and apply for relevant roles by registering online. Candidates will be required to provide detailed information by duly filling out a registration form and uploading their resume. Alankit’s Human Resources team will review the applications received to identify prospective candidates on grounds of their skills, education, and experience meeting the company’s open positions and requirements. Selected candidates will be contacted over the phone to appear in interviews with department heads and the management for further evaluation of their knowledge, skills, and abilities. Interview rounds will be dependent on the type of position and the department the candidate is applying for. Prospective candidates will be assessed on the basis of a thorough screening process, which will entail interviews with department heads and other members of the management. Subsequent information gathered from professional details brought forth by the candidates, interviews and resume discussions will be assessed accordingly. The selection process will also include further reference and background checks on the candidate before a final decision is taken and communicated to the candidate. Shortlisted candidates will be informed about various HR related requirements and on boarding formalities post the selection.